Let's just ignore the fact I haven't blogged for ages... For a variety of reasons, none of which are very interesting. Instead, enjoy this picture of the beautiful Iris x fulvala 'Violacea' which I recently saw at the National Botanic Gardens of Wales. I have had it as my desktop picture for the last few days and I find myself constantly stopping and just looking at it so thought I'd share it with you. It's a cultivated variety from the US and prefers full sun, though might take light shade. I find it elegant and the colours rich, and so very very pretty. Nice picture. 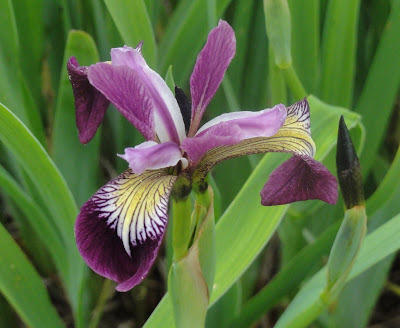 I've always had a soft spot for Iris plants & flowers.